Griffin is a Bootstrap 4.1.3 & Sass based solid core framework that works well for all screen sizes and modern browsers. HTML5 validated code – kept simple and orderly that any developer can pick up easily. 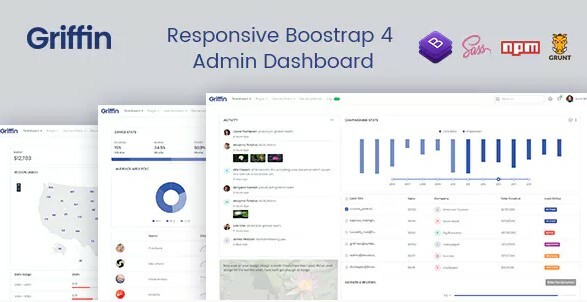 Griffin has a ton of pre-built material that includes 5 dashboards, Authentication Pages, app examples, profile, invoice template, 60+ html pages, and lots of reusable components; which makes it a great kick-starter for your project. With Griffin’s UI components library (1000+ components in 17 categories), you can actually get more time on building stuff, rather than editing pixel distances.